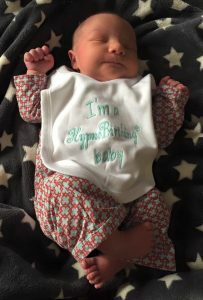 Just wanted to share my hypnobirthing experience in the hope that it might encourage more expectant parents to opt for it. Having had a previous history of anxiety, depression and panic attacks I was looking for something to help reduce any risk of complications during and after birth. I had started off with weekly Yogabellies classes that I felt I was benefitting from, particularly the breathing techniques and relaxation elements and then saw a recommendation for hypnobirthing. My husband was a skeptic and even during the four week course I’m not sure he fully bought into it. However the proof was on the birthing day as to how effective and powerful hypnobirthing is and now he is a true convert! Sandra provided me with so much knowledge and confidence in my body’s ability to manage the big day that I birthed all 8lb 14oz of my little one without any discomfort whatsoever. It was honestly such a pleasurable and relaxing experience. I even slept between surges in the last hour before his birth! This retention of energy made the reduced sleep in the following few days really manageable. I felt fresh and energised and physically normal. Sandra provided loads of support in discussing different options for during birth which meant I had a very comprehensive Birth Plan of preferences. I just felt really ready and prepared! Our confidence grew so much that we even decided to have a home birth. Hospital admission had become kind of unnecessary to me the more I did in preparation. Everything went to plan and we had booked a birthing pool through Sandra also, which made the birth feel very luxurious! I had loved the idea of a water birth but as there’s only one at HRI, this was my way of guaranteeing that I’d get in it!! As a result of the hypnobirthing, we now have a very chilled out baby who loves being spoken to in a hypno type voice ? and the visualisation of blood vessels closing has meant I stopped bleeding after a couple of days so it continues to provide benefits to our little family. Most people can’t believe that I said this, but I woke up the next day wanting to do it all over again. I can’t wait for my next opportunity ?